The main leaf resting temporarily in another flower pot while the baby plantlets started developing. A number of people who visited the Gardens by the Bay have noticed the cute succulent, Sempervivum, also called Hen and Chicks. It starts growing with a main rosette, and then grows new rosettes in an outward spiral, creating the visual of a main plant (the hen) surrounded by smaller plants (the chicks). Well, a few months ago, our Kalanchoe plant, also known as Mother of Thousands, had a broken leaf that had a few new baby plantlets growing along the edges. We let the leaf rest in another plant pot until we suddenly noticed that the baby plantlets had grown roots and were taking root – firmly. So we moved the mama leaf, and her babies that were still attached, to their own pot of dry, used soil. The main leaf slowly began to die off while the babies started to grow. 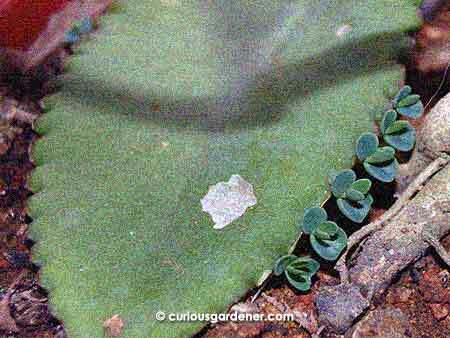 What amazed us was that even more baby plants began to grow as the main leaf withered more. It looked like the plant was determined to propagate as many new plants as possible to ensure its species survived! The new young plants growing around the withering remains of the “mama leaf”. 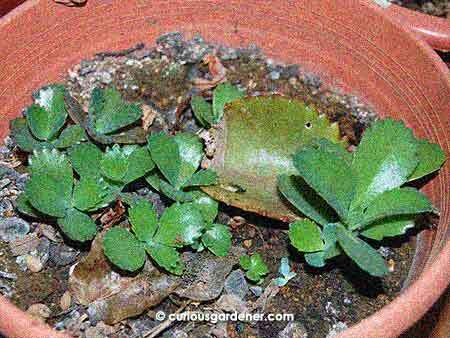 What we’ve ended up with is a pot of very firmly rooted young Kalanchoe plants that are growing around the very slowly withering remains of the main, mother leaf. It reminds me of the sempervivum that had made people start talking. © 2012 curiousgardener.com All rights reserved.